This week’s Match It Monday features the Jamie necklace. The name comes from our fabulous designer and is a cool as her. Wear this necklace hanging out with the family or catching up with old friends. Add the Mia Mixed Necklace to give it an extra touch! We are excited to introduce Match It Monday. Each Monday we are going to choose a piece from our collections and show you how you can wear it. First up is the Monique earrings, featured in gold. These are our Valentine’s Day special! From now until February 13th the Monique is $58 and the Monique Mixed is $68. They are light and easy to wear making them a great everyday pair to wear. They seem to match any outfit, here are a few options that will keep you warm and stylish this winter. The Olympics are here and we are dressing up in style, ready to go for the gold and silver! What better way to bring out your inner Olympian than sporting the Leslie necklace? Designed with 5 hanging rings it resembles the 5 rings of the Olympic logo. Small and dainty, this piece is great for layering or wearing alongside some stylish earrings such as the Tina gold and silver. Polish off the rest of your off look with hues of gold and silver and you are ready to conquer the world, and go for the gold! Here we go Olympics, and go Team USA! You can see our full mixed metal collection on our website for more ways to go for your best gold and silver performance. Here at LJ we are all about layering our pieces together, in fact we try and keep layering in mind when designing each piece. Some pieces layer better than others, but it is good to remember to keep your options open and to not be afraid of being creative. Today we are going to give a little ‘how to’ on the best way to layer up on your jewels. First of all don’t be afraid to mix and match stones. Sometimes people are timid when it comes to mixing stones such as pearls with turquoise or labradorite, but you will find that the mixture can give you more depth and a great variety of color. Also, it is great to keep the necklaces at varying lengths to give you different levels of interest and to maximize the focal point. If you are choosing to layer up a lot of necklaces think about keeping your outfit simple, the jewelry will do the job of bringing pizazz to your look without overpowering it. We have chosen a few options of our LJ necklaces layered up to give you the best idea of what works. Take classic black with a mixture of white pearls, champagne pearls, and throw in a chunk of turquoise for a classically cool look. Give a bright casual look a little bit of class and contrast. Take a basic white tee and make it flirty and fun, with a pop of bright color. So here are three different ways to layer with different color, textures, and stones. Find different ways to mix and match your jewels and you may be surprised at the great looks you can come up with. 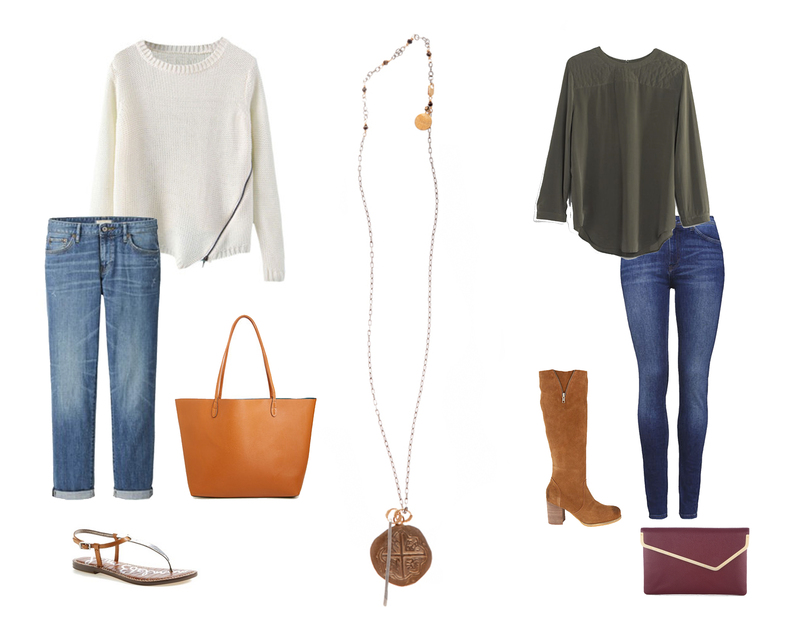 Which layering look is your favorite? How do you like to layer your jewels?